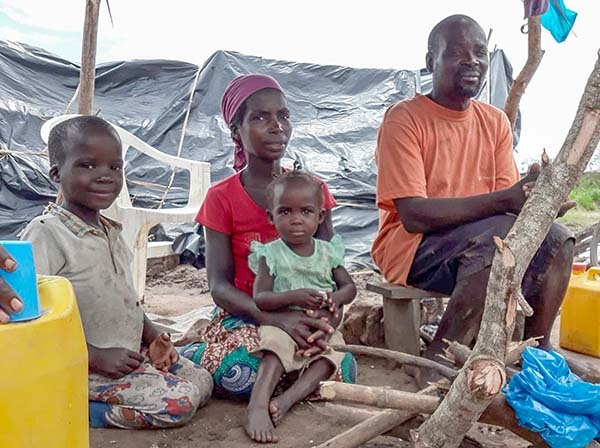 José Eduardo and his wife, Louise Gonquim, were living on their farm in Mozambique when tropical Cyclone Idai crashed into the country, throwing their lives into chaos and uncertainty. José and Louise had to keep their kids–ages 2, 7 and 13–awake to stop them from falling into the water. Now, like the hundreds of thousands of people devastated by Cyclone Idai, José and Louise are waiting to see when and how they can access food. CRS—along with local partners—is working quickly to provide emergency support across the region, including food, emergency shelter, water and living supplies for flood affected families. Cycle Idai struck suddenly, and communities had no time to prepare. “There were people who held on to clothing lines to withstand the water,” said Hannah Kyle, international development fellow with Catholic Relief Services in Mozambique. The aftermath is still claiming victims, and critical infrastructure like roads, bridges and utilities have been badly affected. The cost of food is increasing dramatically at a time when household incomes have been lost. “People are living in flimsy makeshift shelters—bits of plastic and tent sheeting they’ve been able to find,” said Donal. Farmers depend on their land for their home, income and food, but they can’t come back after the cyclone. “The flood had washed in a lot of sand. This is now covering the land, which has made it unusable,” explains Donal. Even before Cyclone Idai hit Southern Africa, a combination of frequent droughts and flooding had devastated farmland, affecting thousands of farmers in the region. CRS is working closely with our Caritas partners in Zimbabwe, Malawi and Mozambique–addressing both the emergency response and longer-term recovery.